The Sequential Two S210, a subtle balance between elegance and technology, combines the brand's unique craftsmanship with its creative passion. In the two new limited edition S210s, the singular style of the MCT-S2.0 movement is showcased by a new dial background: anthracite or champagne, whose silky appearance contrasts with the technical look of this timepiece. Once again, MCT draws inspiration from contemporary architecture: aggressive edges, bright minutes displays combined with more extensive curves, a composition reminiscent of the inventive urbanism of large American or Asian cities. A brand signature, the cross-shaped structure is now adorned with a highly original curve following that of the sapphire crystal which accentuates the relief of the Sequential movement, to which it is affixed by four screws. The circular satin-brushed finish and the polished chamfering of its edges create an elegant play of light. These two references, each produced in 25 copies, enrich the Sequential Two range and demonstrate the ability of the Contemporary Manufacture of Time to reinvent itself while retaining its uniqueness. The self-winding MCT-S2.0 movement was designed, developed and assembled internally at the brand's workshops in Neuchâtel: a vertical integration strategy that covers the entire production chain. Constantly optimised, thanks in particular to this approach, behind its pure lines this movement conceals 654 highly technical components. As with its elder sisters, the hours are displayed in oversized numerals on four surfaces, each composed of five prisms. The C-shaped central disc displays the current time through its aperture, while concealing the others. When the hour changes, it suddenly turns 90° in an anticlockwise direction to display the following hour. The minutes markers are displayed on the rim of the dial. A large central hand guarantees its readability. The sapphire crystal case back allows a glimpse of the black bridges of the movement, admirably hand-finished, which stand out against the oscillating weight of the off-centred pink gold micro-rotor, the screws and the balance. Thanks to the ergonomic design of its lugs, the case is as comfortable as it is elegant. The iconic Sequential display comes in a round 46.4 mm case, available in grade 5 titanium, with DLC treatment. 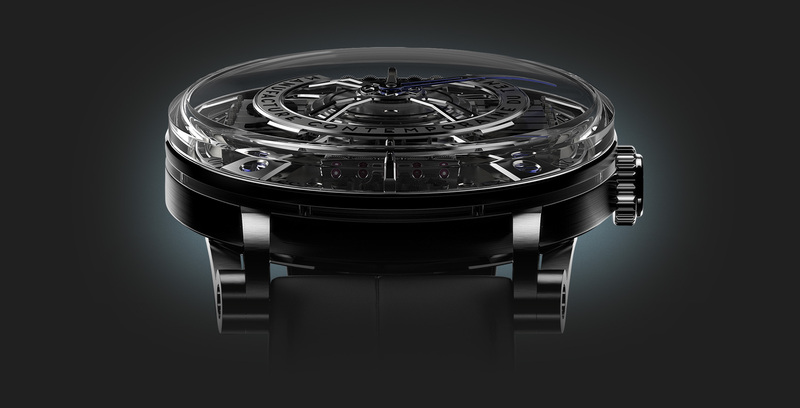 The combination of the sapphire crystals with glareproof treatment and the joint of the case middle, also in sapphire crystal, allows the light to pass throughout the case, therefore highlighting the complications and allowing the finishes of the micromechanics to be admired. Large sequential hour display by four modules of five prisms: minutes display. Four modules: four numbers on each module: each time module is composed of five prisms. MCT-S2.0 mechanical movement developed internally, Self-winding with 18K gold micro-rotor, Balance frequency 2.5 Hz /18,000 vibrations per hour, Breguet curved balance spring, Power reserve: Minimum 40 hours, Outline of the high-efficiency pinions, Chamfering and hand-polished Côtes de Genève, No. of components: 654, jewels 89. Diameter 46.4 mm, thickness (at the centre) 15.1 mm. Titanium or titanium with DLC coating and sapphire crystal ring around the case middle. Composed of 56 parts. Sapphire crystals: double glareproof coating on the crystal of the dial, glareproof coating on the crystal of the case back. Alligator leather with hypoallergenic lining on the inside; double hand stitching; titanium triple folding clasp.